Historic Temples in Pakistan: A Call to Concience makes a case for keeping ancient emblems of faith alive and for pluralism in a land of irony that has been home to multiple ancient faiths yet stands besieged by unpalatable extremism. It also aspires to enshrine the ideal of liberty. By framing an all-inclusive piety, this book sets out to ignite a discourse and the collective conscience of a nation numbed into silence, fear or the false conviction of the supremacy of a singular region—to institutionalise the fundamental right of will. Elaborately embellished with evocative photographs of antiquated and exquisite Hindu shrines, opulent rituals and festivals and regional populace, the chronicle has extensive research and exceptional pilgrimage sites—Hinglaj, Katas Raj, Kalka Cave Temple, Panchmukhi Hanuman Mandir and Shivala Mandir, to name a few. While vivid introductions and sweeping images present the landscape and the social fabric of a territory, the redolence of celebration spread passion and fervor. A special article introduces the extraordinary Fakira, last of the human hands behind idols in Pakistan. Humanity is cast as the oldest of creeds and as the reason for faiths. Therefore, devotion cannot be reserved for a sole Call to Prayer. Reema Abbasi was the recipient of the Gender in Journalism Award 2003 from UNESCO for the most gender sensitive reportage. A journalist for almost 19 years, she began with culture and lifestyle at The News International, moved on to crime and sociao-political writing with The Herald Magazine and then became an editorial writer at Dawn. At present, she is a columnist with The Daily Mail, Mail Today and an independent contributor with Dawn and The Indian Express. In the last decade, Reema’s writings have maintained a rabid focus on the values of secularism. With this book, she aims to stir a discourse that dispels intolerance towards any faith and shuns the concept of religious power. She attended Sherborne School for Girls in England and St. Joseph’s College in Karachi, Pakistan. Her other passion include music, reading, writing and research, cinema, travel, art, poetry, and yoga. Madiha Aijaz studied at the Indus Valley School of Art and Architecture (IVS) in Karachi, Pakistan and at Parsons in New York City. In 2007, she was awarded the Fulbright scholarship for photography. Her work has been exhibited in Pakistan, the United States and South Africa. In 2011, her short story ‘Swimming Pool’ was adapted or radio by the Commonwealth Broadcasting Association. She currently teaches photography at IVS. Asensible man's favourite dream, in my view, should be to see religious monuments disappear into history with disuse, when nature takes its toll. How much better would that be than the currently fashionable factor in the waning of faith-based structures-human bigotry, spurred by competitive religion? It is this bigotry, more than any other hangover from the past, that has given South Asia unparalleled notoriety, from Bamyan to Ayodhya, from Larkana in Sindh to Banshkhali Upazila in Bangladesh. The dominant mystical route to salvation, on the other hand, finds neither the act of building nor the destruction of monuments of any great relevance. 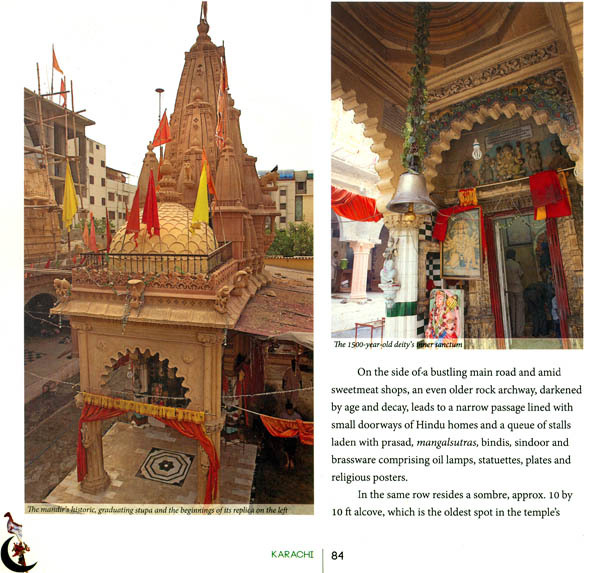 So why has Reema Abbasi worked so diligently and on this beautiful book on the Hindu temples in Pakistan? We know, for example, what the Taliban or the Kar Sevaks would have us believe on the subject of their and your places of worship. Consider the rebuke or contempt though, that Bulleh Shah or Kabir, or Mir Taqi Mir would proffer on the issue, albeit in their slightly varying timelines. 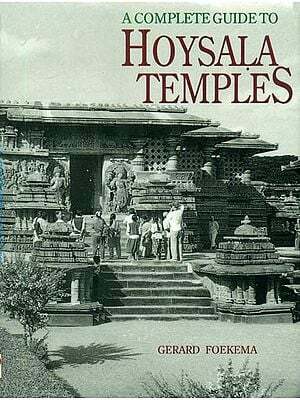 Ms Abbasi's insightful project on temples must inevitably grapple with the spirit and reality of some of these compelling, if subversive, positions of her own peers. There is adequate hint in the book that its subject forms a core of Ms Abbasi's syncretic cultural pursuit, which I can only surmise as a belief in the equality of all religions. In her view, perhaps it would be handy for the flagging state and civil society to protect the architectural relics of a significant tradition that otherwise mingles seamlessly with the history of Pakistan. This endeavour will not be easy, of course, for she is pitted against both the zeal of religious bigots and the benign aloofness of the spiritual gurus she admires. With such high-ranking peers she dotes on, but who are poised to mock her endeavours as a fruitless enterprise, where did Reema Abbasi draw her inspiration to persist with the book? Her wellsprings may well lie in her personal traumas, to have watched reckless mobs tearing up defenseless and vulnerable traditions of coexistence, of watching vandals razing mosques, temples, churches to derive misplaced pleasure, mostly with political advantage. The destruction of the Bamiyan Buddhas in Afghanistan is cited as an aspect of resurgent Islam, of which the Taliban are an offshoot. How are we to then explain the bronze plaque outside the ancient Abu Simbel Temple of Ramses II that was rescued from its watery grave in the Aswan Dam in Egypt with the help of Russians, and which carries a message in English from President Gamal Abdel Nasser: 'We thank the Almighty Allah for this gift of our great and cherished heritage: Is Reema Abbasi a Nasserite? Pakistan is in a season of surrender. The nation resonates with dissonance of fear and bigotry; trapped in a present unmindful of a softer past, the country faces a clear danger of an unkind future. Ironically, Pakistan's tragedies are not mired in hopelessness but in the plethora of possibilities eroding into oblivion. The battle is to free hope from the fringes of the conscience and consciousness; erase malignant apathy; to rescue Islam's secular values from Islamism, and to celebrate divinity by pledging consecration for its prime avatar-Humanity. My sentiments, best captured in Ghalib's immortal lines- 'hai tamashagah-e-soz-e taaza har yak a 'zu-e-tann, joon chiraghan-e-diwali saf jalta hoon mein' (Each fragment of my body has a new fire, akin to the flames of Diwali, I burn in strings of rows)-led to this endeavour. 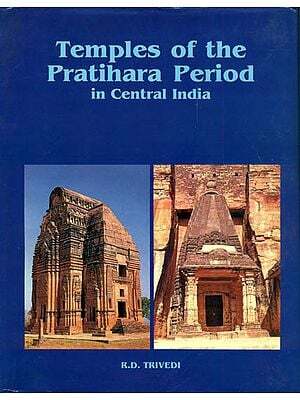 A discriminatory status quo must be stirred to sanctify pluralism, diversity of citizenry and a cache of heritage such as the antiquated Hindu temples documented here. My sensibilities have been redefined by the current climate of my country, an antithesis of the confluence I grew up in. This journey for the ideal of coexistence took over a year of rigorous travels across Pakistan. The treacherous, jagged terrain of Balochistan is where Hinglaj unifies all and sundry. Khyber Pakhtunkhwa freezes spines with vile headlines but springs a wonderful surprise as a lush landscape of interfaith harmony, barring a few extremist pockets towards the north. Verdant Punjab is a heartbreaker-the seat of power paints a picture of gloom for minorities to the extent that they live with the burden of false identities and their temples are without deities; moorti-makers have fled the province. However, Sindh, including Thar and Nagarparkar, has stayed true to its mystical influences. But this Sufi seat shook with a spate of incidents when prime temples and a dharamshala were assailed for land-grab by internal displacees. Hence, this book concentrates on Pakistan's fraying social order and the sad prospect of it bringing about its own destruction by documenting Hindu places of worship, major festivals, prominent orders of priesthood and the master idol-crafter, Fakira. Historic Temples in Pakistan: A Call to Conscience has many layers-the first five chapters look in detail at the life and times of the most antiquated temples in every region. 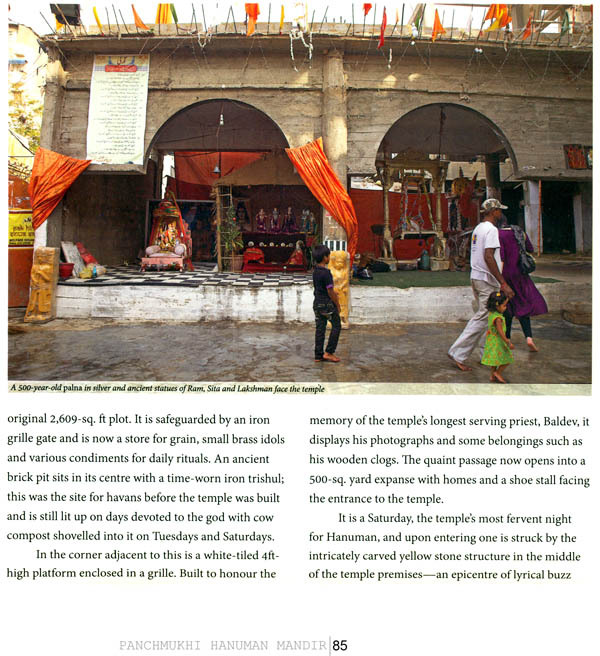 It details renowned teeraths-Hinglaj, Katas Raj, Sadhu Bela, Karachi's 1500-year-old Panchmukhi Hanuman Mandir, Kalibari Balmiki Temple in Peshawar and many more. Sweeping introductions about the landscape, people and history of an area open each section and a sixth, Lifelines, covers prime days of fervour on the Hindu calendar as celebrated in Pakistan. It has one message: as long as Life is infinite, faiths will be indestructible. 'No, because these are the converted peoples of Islam. To put it brutally, these are the people who are not Arabs. 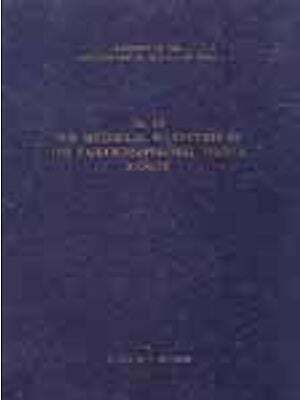 Part of the neurosis of the convert is that he always has to prove himself; he had replied-views found in his book Beyond Belief Islamic Excursions among the Converted Peoples. History, however, is a fountainhead of hope. It dilutes Naipaul's unforgiving theory, especially for Pakistan and the region, with Sufism. The subcontinent inherited Islam from the liberal, idealistic Sufis who brought an all-pervasive doctrine of Wahdat al- Wujud; of love infused with wisdom and virtue and the unity among faiths, without dimming or deconstructing spiritual structures. A self-contained belief tradition, Sufism saw divergence and unison as subservient to the same Oneness. Lamentably, the Pakistan context begins at Partition when some six million Hindus left Pakistan for India. Almost an equal number of Muslims migrated from India to Pakistan in a climate fraught with communal tension and a strong undercurrent of distrust between the two nations. Today, on one end is the increasingly popular rhetoric of hate preached by the right wing elements on both sides; and on the other are the efforts of an apparent amelioration through dialogue, people-to- people contact, trade and peace movements such as 'Aman ki Asha' But a long term resolution of political issues such as the Kashmir impasse is far from imminent. Hence, continuing communal discord is a harsh reality, as is the persecution of minorities and hostilities along the border. Political baggage aside, the intensifying sweep of extremism forced more than 500 Hindus to flee the country last year and many more were uprooted within Pakistan as they escaped terrorist strongholds for Sindh. The situation at present is not heartening, but a trip down ancient lanes of history is. It is believed that the culture and faith of the Indus Valley people was an important influence on Hinduism the way it is known in this quarter of South Asia. The region, however, became predominantly Muslim during the rule of the Delhi Sultanate, the years of Mughal rule and the spread of Sufism. For all these arguments and reasons, the temples of Pakistan are so much more than mere symbols of faith for a religious minority. Not only are they vestiges of ancient lore in Hindu mythology, they also stand like warriors of Time; pitted testaments of a peaceful, pluralistic past. At times like these, civilisations in denial can reinvent themselves through free expression of faith and ideas. In today's Pakistan, Ghalib's epic ode to Benares, Chiragh-e-Dair (The Temple Lamp), where he hails Kashi as Kaaba-i-Hind, could only have known the silence of a grave. Therefore, the time is now ripe to put paid to divides that are likely to cost an entire country its rationale.